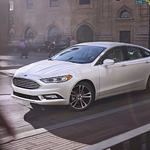 If you want to see what all the excitement is concerning the new Ford Fusion, look at some of the smart features in this amazing midsize sedan. Driving the all-new Ford Fusion on the highway and you can trust that the Blind Spot Information System is working hard to keep you and other motorists safe. If a vehicle has been detected inside your blind spot, the corresponding side mirror on your car flashes, reminding you to not leave the lane until the car has cleared. Whether you are tired or distracted, if your new Ford Fusion drifts over the car lines repeatedly, the Lane-Keeping System kicks into gear. The steering wheel vibrates to try to get the attention of the driver, similar to the feeling when the car rides over several rumble strips. The new Ford Fusion is on the lot at Mullinax Ford of Kissimmee and available for a test drive now.